Easily resize and compress images. Provides Twig filter and PHP method. Works well with plugins such as blog, user, carousel, form, contact, shop, gallery, slider, etc by creating a thumb of original image. Works with the fileupload and mediafinder plugin field types, can be used on general site images pretty much anywhere and works with other plugins, e.g. Static page plugin, October Blog, etc with no extra changes required. Provides greater control over how an image is rendered. Manage a list of staff or a team and display it on your website. # 318 in Free of all time. Please note, the not found image can be overwritten via the settings in the admin area. The image resizer can also be used on backend lists with the type of thumb, e.g. Is there a tutorial on using plugin? Does anyone know how to clear images cache? I've tried using https://octobercms.com/plugin/romanov-clearcachewidget but it doesn't clean cached images. Does it? I think the plugin needs the source image stored at the own server, but I want to be sure. Hi, the plugin is great. Thank you for your work. Could you please have a look? Thanks again. The partial '_field_thumb.htm' is missing. How do you crop, like from center? The URL that is generated returns a Page not found error? Do you know what is happening? The plugin relies on Octobers built in image resizer. A change on version of 420+ meant the url was stored slightly differently. This has now been fixed with v1.3.5. I love to use this plugin. But sometime when I try to rescale a lot of pictures, or one big picture I get an 500 Internal Error. I use Nginx and PHP 7.1.9, is there a way to solve this? This is a great plug-in that allows for the creator to upload the mega images created by most phones and SLR cameras and then elegantly resample them to optimal size. works like a charm. Great plugin. Is there a way to clear the cache? Yes, I tend to use the PHP usage either on a schedule or on the onSave/onUpdate controller methods if its a backend form. Just ensure the width/height and settings are identical between the twig and PHP usages to take advantage of the caching. Very useful and practical utility. It gives some new opportunities in using Media Library and optimise media content. I use it a lot especially with TinyPNG. However, it has a peculiarity as well. When using RainLab Blog you can apply getThumb to a featured image and you have your thumbs created in the same upload folder where your original file is stored. The Image Resizer in this situation creates a new upload folder, copy the original in to it as a file without extension, then creates thumbs there. As a result, you have 2 copies of the original file in different folders, double your file structure and used storage space. If your storage is limited, this feature becomes an issue. I am not sure if there is a good reason to keep the second copy of the original file. Thanks for the feedback. The plugin actually uses the getThumb method you mentioned to resize the images, this is why the original image is copied into the directory. I will have a look to see if it's possible to avoid this. I've added it as an issue on the repo (https://github.com/toughdeveloper/oc-imageresizer-plugin/issues/18) so it doesn't get forgotten about. Very Nice, All in one. Note: Make sure image do not have space in it. I struggled for many days to make it working and finally realized that my image file names were like - "Media Lab.jpg". I changed it to "Media_Lab.jpg" and everything started working. Thanks for letting me know. I have added this as an issue to github - https://github.com/toughdeveloper/oc-imageresizer-plugin/issues/15 and will try get a fix together ASAP. Update: Unable to replicate, if anyone else is experiencing this issues, please help by adding more information to github issue linked above. This should be included in October as a default. I was just looking for this. 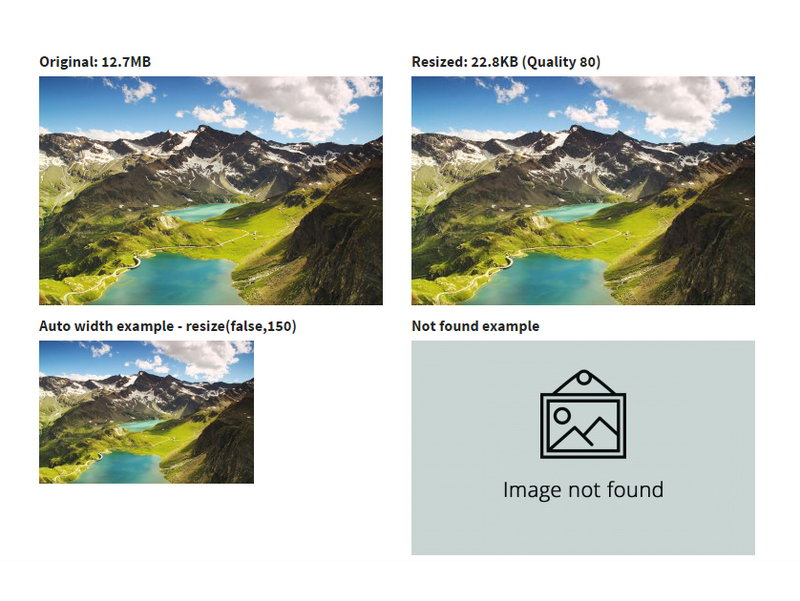 The result I get is a image placeholder with the text "Image not Found". The relative path (based on theme) is correct. If I remove the resize filter the image works fine. Any idea what maybe causing this? Hey, thanks for using the plugin. Just had a play around and was able to replicate the problem when altering the url setting in config/app.php. For it to work it with the theme filter it needed to be in the format of www.mydomain.tld (no http:// or https://). Please message me if you don't think this is the issue. Update: Bugfix pushed, let me know if the problem persists. Adds option to skip compression of certain images, helpful to save credits. Ensures plugin works as expected when October is installed to a sub-directory. Ensures false can be passed to auto width/height. Also improves URL parsing so different formats of app.url work as expected. Thanks to Emerge. Fixes bug where url set in config/app.php affecting rendering of image.